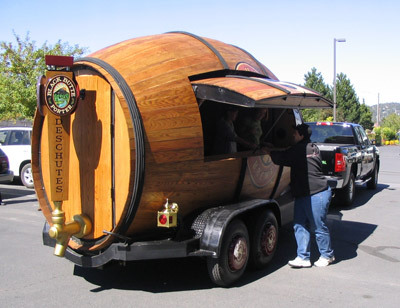 Oregon’s Deschutes Brewery has built a a portable pub in the shape of a giant beer barrel. It will roll through several Seattle neighborhoods over the next few weeks. The enormous barrel, fabricated by Hollywood designer Eddie Paul, makes its first appearance at the Fremont Oktoberfest September 21-23, then stops at the Red Bull Soapbox Race September 29. During October, the rolling barrel, accompanied by food and music from local bands, opens its taps in Capitol Hill, Wallingford and South Lake Union before returning to the Queen Anne-Fremont neighborhood. Each Neighborhood Hops event will feature a selection of Deschutes beers, including Mirror Pond Pale Ale, Black Butte Porter and Inversion IPA. A rotation of pre-release beers will also be available, including the new Green Lakes Organic Ale. Admission to the Neighborhood Hops events is free. Pints of Deschutes Brewery beers and food from local partners will be available for purchase. Proceeds from the events will be donated to a variety of local non-profits including the Puget Soundkeeper Alliance , protecting and preserving Puget Sound for more than 20 years, and Gilda’s Club Seattle.